The Whales began a study of the Grimm's Fairytale, The Shoemaker & The Elves. We listened to many versions of the fairytale; comparing and contrasting elements of the text, setting, characters and illustrations. Practicing our fine motor and art skills, we designed a shoe we could lace and tie. Using skills in numeracy, we sorted a rather large collection of shoes in many different ways: by color, size, and type of shoe. Our storytelling table was set up with a snowy scene, complete with little elves, a shoemaker and his wife; and the Whales spent time re-telling a version of the story on their own. The Whales were lucky enough to be invited to watch a real live cobbler do his work! On a particularly wet and wooly morning, the Whales walked across campus to pay a visit to Mr. Dennis at The Shoe Clinic. He invited us into his workroom, where Whales learned about how shoes were taken apart and then put back together. We learned that cobblers use leather, thick thread, small nails and hammers, brushes, and shoe stretchers to do their work. 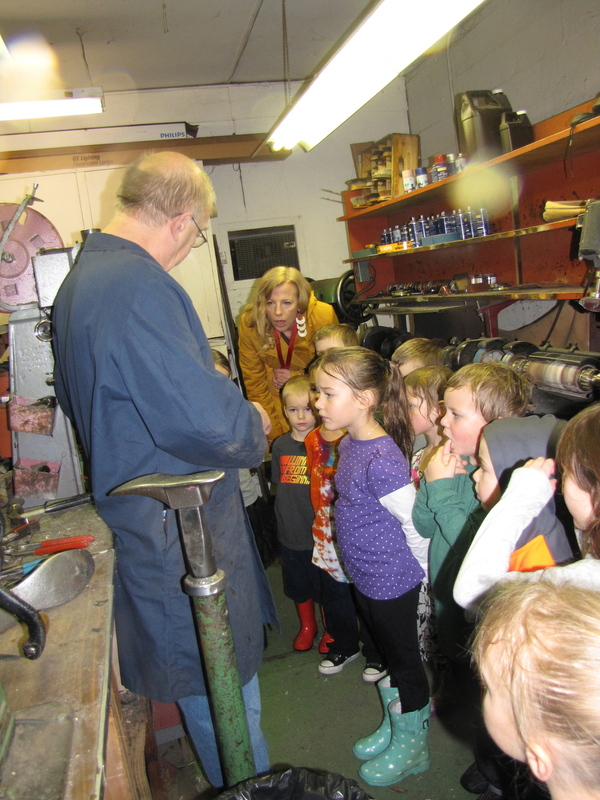 We learned that a cobbler uses lots of special machines to make old shoes look brand new again! Later in the week, the Whales watched a puppet performance of the story, acted out by Ms. Julie and Ms. Ellie. On Friday, we had out first dress rehearsal for our play next week!